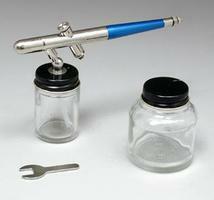 Shop online for 98 airbrushes and airbrush sets at discounts up to 38%. 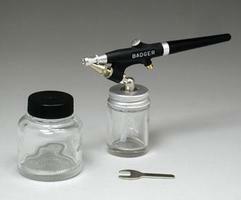 Badger Airbrush Co. is ranked #1 out of 6 airbrushes and airbrush sets manufacturers, followed by Paasche Airbrush Comp., and Iwata Airbrush & Accessories. The Model 250 single action, external mix, bottom feed spray gun is great for any job requiring a simple, yet effective spray. The Model 250 is basic enough for children, (ages 8 and up) to use with minimal adult supervision, yet effective enough for adult use. This gun is perfect for jobs requiring large overall coverage with medium to heavy viscosity materials. Modeling, school projects, home improvement projects, workshop jobs, ceramic underglazing, fogging, texturing and stenciling can all be handled by the Model 250. The spray pattern can be adjusted from ¾" to 2" simply by turning the paint tip. 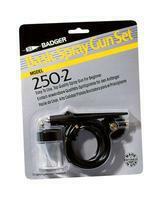 The Model 250 uses ¾ oz. or 2 oz. capacity jars. . The Model 250 single action, external mix, bottom feed spray gun is great for any job requiring a simple, yet effective spray. The Model 250 is basic enough for children, (ages 8 and up) to use with minimal adult supervision, yet effective enough for adult use. This gun is perfect for jobs requiring large overall coverage with medium to heavy viscosity materials. Modeling, school projects, home improvement projects, workshop jobs, ceramic underglazing, fogging, texturing and stenciling can all be handled by the Model 250. The spray pattern can be adjusted from 3/4" to 2" simply by turning the paint tip. The Model 250 uses 3/4 oz. or 2 oz. capacity jars. The Model 200 NH bottom feed single action, internal mix airbrush offers the ease of single action operation while providing the fine spray pattern of internal mix paint atomization for professional results. The Model 200 NH will sprays inks, dyes, watercolors, gouaches, properly reduced acrylics, fabric paints, model paints, automotive lacquers and enamels, most ceramic stains and glazes, all of Badger airbrush ready paints. The simplicity of the Model 200 NH makes this the top choice for the advanced model painter or decorative stenciler. 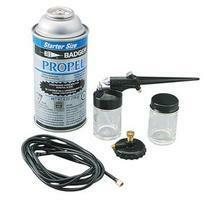 Also excellent air brush for painting posters, auto detailing and ceramics. . . . 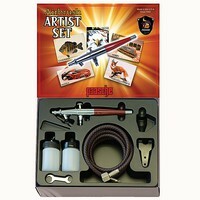 The Model 155, "Anthem" is a bottom feed double action, internal mix airbrush. The Anthem is the most comfortable, reliable, proficient, cost effective, user friendly airbrush ever. The two angle needle tip precisely mates with the Anthem's cone shape nozzle enabling a single needle/nozzle variations. The Anthem's body design provides exacting balance and long term user comfort. The most rigorous of production airbrushing environments. . 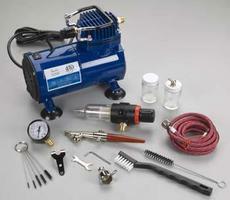 This is the Testor Mighty Mini Airbrush and Compressor set. 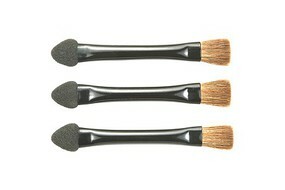 This airbrush runs the gamut from fine detail to background coverage. 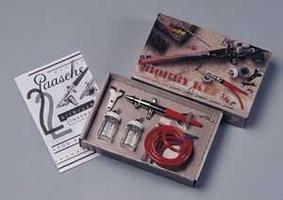 This is the H Airbrush Only (H#1L) from The Paasche Airbrush Company.